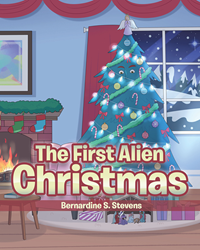 “The First Alien Christmas” from Christian Faith Publishing author Bernardine Stevens is a delightful story about an advanced alien race from distant Zorn, whose once-vibrant planet is slowly dying. In a mission to save her people, Empress Eigna sends her most trusted agent Ybbuc to Earth to discover a way for the carbon-dioxide-dependent Zornians to adapt to the humans’ world—and when Ybbuc goes undercover as a spruce tree in Christmas City U.S.A. he learns about love and the meaning of the holiday, as well as a nonviolent way to bring both races together in harmony. “The First Alien Christmas”: a story about the kindest alien invasion ever. “The First Alien Christmas” is the creation of published author Bernardine S. Stevens, a children’s book author and magazine contributor who also writes nonfiction pieces for adults; based in Florida, she travels all over the US and Canada with her husband in their motor coach while maintaining a blog for fellow motorcycle enthusiasts. Stevens writes about the alien agent’s brilliant solution, “‘Ybbuc, why has your skin turned green?’ asked the empress. Ybbuc looked at his hands for the first time since he changed back into his alien form. His skin was a beautiful bluish-green color, just like the blue spruce! He proceeded to tell everyone about trees, photosynthesis, and the symbiotic relationship trees had with humans. Published by Christian Faith Publishing, Bernardine S. Stevens’s new book is a fascinating new look at beloved Christmas traditions through the eyes of a curious alien invader disguised as a Christmas tree. The story of Ybbuc and the Zornians offers itself as a wonderful “what-if” tale to add to the bookshelf of Christmastime family classics. View a synopsis of “The First Alien Christmas” on YouTube. Consumers can purchase “The First Alien Christmas” at traditional brick & mortar bookstores, or online at Amazon.com, Apple iTunes store, or Barnes and Noble. For additional information or inquiries about “The First Alien Christmas”, contact the Christian Faith Publishing media department at 866-554-0919.